1. Deepika Padukone or this Victoria’s Secret Angel: Who wore the Prabal Gurung gown better? For us, there’s a clear winner here! We think the Padmavati actress wore her look better and those cascading curls completely floored us. 2. 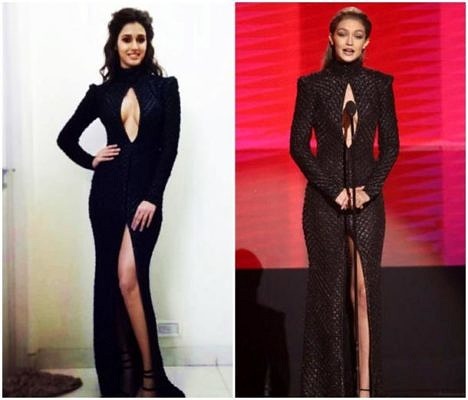 Disha Patani or Gigi Hadid: The black keyhole gown the leggy lass carried off to the Filmfare is hard to forget, but what’s surprising is that it is exactly the same gown that Hadid pulled off during the AMA presentation. 3. 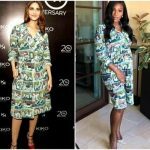 Vaani Kapoor or Serena Williams: The Befikre actress was spotted in a a printed trench dress by Burberry with a belt cinching at the waist. While it looked great on her, Serena also carried off the same dress a while ago. 4. Aishwarya Rai Bachchan or Kristin Chenoweth: The former Miss World’s one of the iconic Cannes look was the golden Roberto Cavalli gown with a fishtail hem at the end. 5. Katrina Kaif or Rita Ora: Kaif looked ravishing in a red Versace dress that Ora pulled off at the red carpet earlier. Who do you think looks better? 6. Alia Bhatt or Jennifer Lopez: Alia Bhatt rocked a bright satin saffron Dior dress that JLo has pulled off earlier. 7. 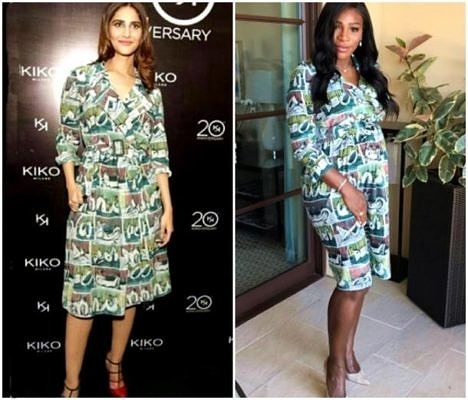 Priyanka Chopra or Naomi Harris: The Baywatch actress pulled off the same black dress that Harris had worn at a film premiere. Sadly, nothing can be hidden or forgotten in the age of Internet. 8. Kangana Ranaut or Emma Stone: The Queen actress copied a sequin blue-green Burberry dress that Emma Stone had earlier been spotted in. 9. Deepika Padukone or Kylie Minogue: Padukone’s bright orange dress that her sister also wore to an award show is actually a copy from singer Kylie Minogue’s wardrobe. 10. Malaika Arora or Paris Hilton: Malaika wore a monochromatic short dress which seemed to have been borrowed from Hilton’s fashion books.